Last Updated: January 6, 2016, 3:14PM. This page will constantly update to complete all details you will need in attending parties around Sinulog week. It’s my 3rd year to attend Sinulog! Yey! And John’s… well, Nth. It was so much fun attending the mother of all festivals. And there are waaayy too many things you can do during your stay in Cebu, mostly eating and checking great places around. But each of us must choose a path, and we’re taking the pretty much balanced version: 40% tradition, 40% partying, 20% Cebu adventures. We are all aware that the 2016 edition of Sinulog Festival seemed a little bit more strict. Sinulog Foundation, Inc. has restricted street parties on the official Streetdance Festival Route (The “Carousel”). Tourists from all over the country were getting the festival dancers DRUNK! Yes that’s right. Pretty irresponsible huh? Imagine all the hardwork and effort (some contingents rehearse a full choreo for almost half-year!) to deliver a perfect routine to celebrate Sto. Nino de Cebu, and then voila! You’re just gonna give them alcohol shots throughout. Drunk people passes out on the dance route. There have been a couple of photos on the internet showing a bunch of guys and girls sleeping on the streets and it brought mixed reactions from the netizens especially from the ones living in Cebu. Some slept on the festival route. Not cool. If you haven’t read our Cebu Sinulog Tips Survival Guide, take some time to check it out. Those are the basics! Now here’s some additional points to ponder for this year’s Sunday big day! As part of our observation during the past 2 years, we were on a “perfect attendance” of getting our foot cut mildly from the broken bottles around the streets. This is possible especially when you bring yourself on that baseline walkway (and possibly a stampede), and people lead your feet to the bangketa, which usually has those dangerous sharp pieces ready for their victims. Best is to wear a durable shoes, but something that’s not hard to wash from all the paint and stains after the big day. Make sure you have the entire gang with you so you don’t end up waking up on a public establishment at 5am. I will have to mention this again. You got at least 3 nights to eat all Cebu’s delicacies, drink all the alcohol you’d like, and dance ’til all lights are out. Why not spend at least an hour to pay homage to Sto. Nino de Cebu, the very reason why the festival exists in the first place? It’s because those spaces will either contain: A huge amount of broken bottles; canal and the burak; or a drunk person. So just keep and walk in flow with the crowd. Locked and loaded for the week’s events? 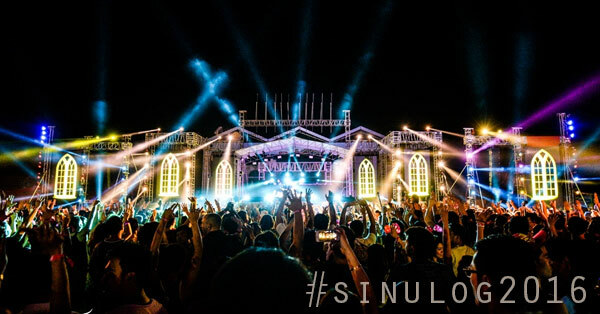 Here are the definitive list of this year’s Sinulog events you can spend the entire evening partying out! Probably one of the biggest events to watch out for with the biggest lineup of local and international DJs. New World Sound from Australia, Tom Swoon from Poland, Felguk from Brazil, and DJ Snake from France, and a whole lot more. Happening in San Pedro Calungsod Shrine Area in SRP on January 15, 2016. For more info and tickets, visit LifeDanceCebu.com. Checkout Hyper Club Roof, the Club that Jungle Circuit Party will invade this SINULOG Friday, January 15, 2016. Choose your Table and Call the Jungle Hotline at 09178615747 or message us at www.facebook.com/junglecircuitparty. Buy your tickets now for PhP300 only at SM Ticket Centers Nationwide or online (https://smtickets.com/events/view/4063). Featuring DJs Travis Monsod, Marc Marasigan, Jay Santos, Toy Armada, Brian Cua, Cal Soesanto, Ed, MC Orion and Martin Buen! UNLEASH THE ANIMAL WITHIN! 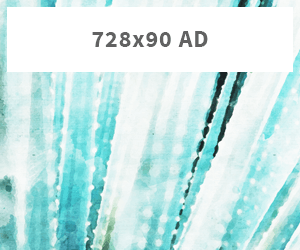 Because you asked for it, we’re bringing it back! ETC PAINTensity is heading to Cebu in January! Keep it here at Our Travel Dates for more details. Get wild, get wild again, and get foamed! 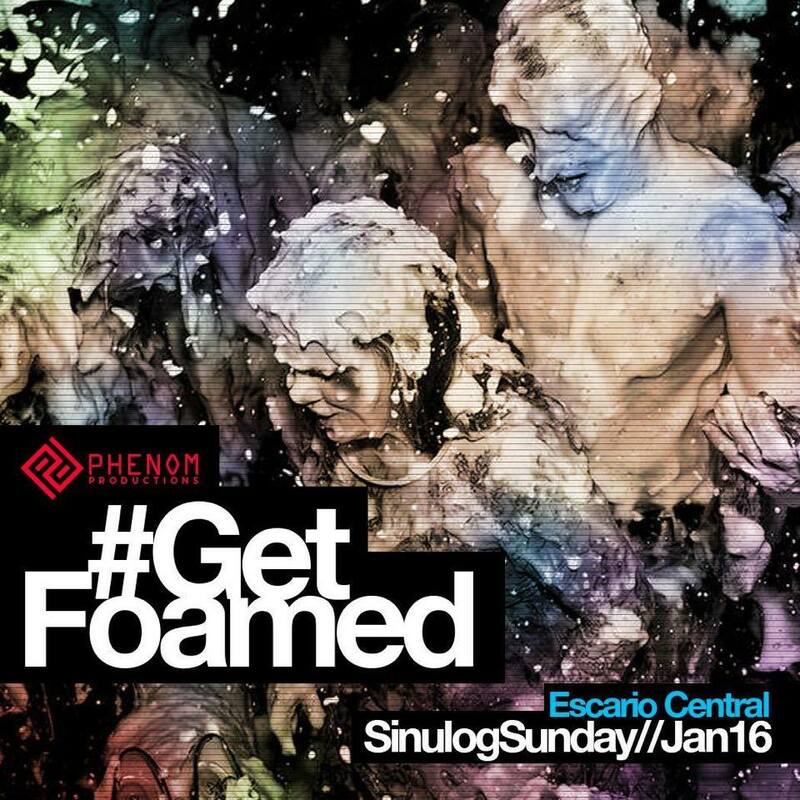 Phenom Productions presents #GetFoamed, happening at Escario Central starting 8PM on January 16th. The wildest FOAM PARTY in the heart of Metro Cebu. 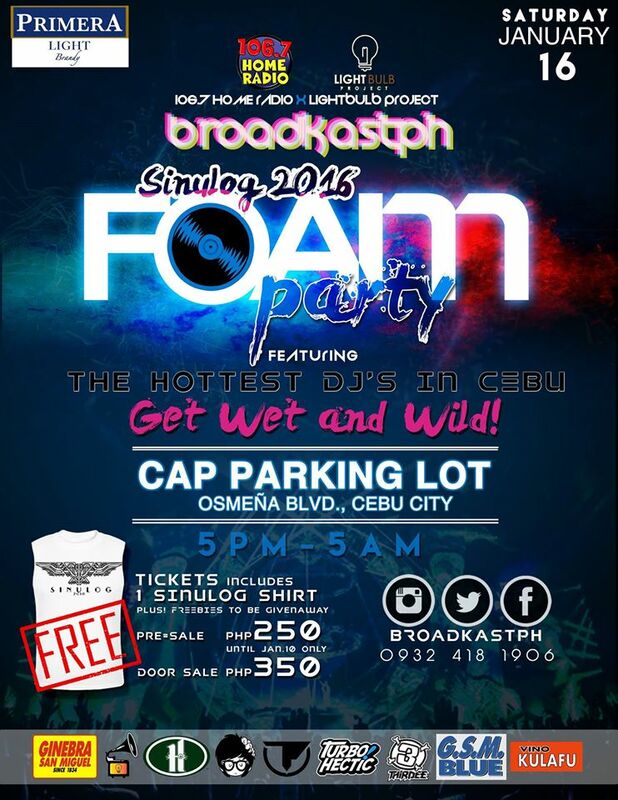 106.7 Home Radio Cebu x LIGHTBULB PROJECT with Ginebra San Miguel, Inc. – Primera Light Brandy brings you “BROADKASTPH SINULOG 2016”. Come and join us on January 16, 2016 at CAP Theater Cebu – PARKING LOT and witness a party like no other. Lots of surprises and giveaways are up for grabs just for you. Tickets are sold for php250 with FREE Sinulog shirt (until January 10 only). It’s an all-out pool party in Mactan! 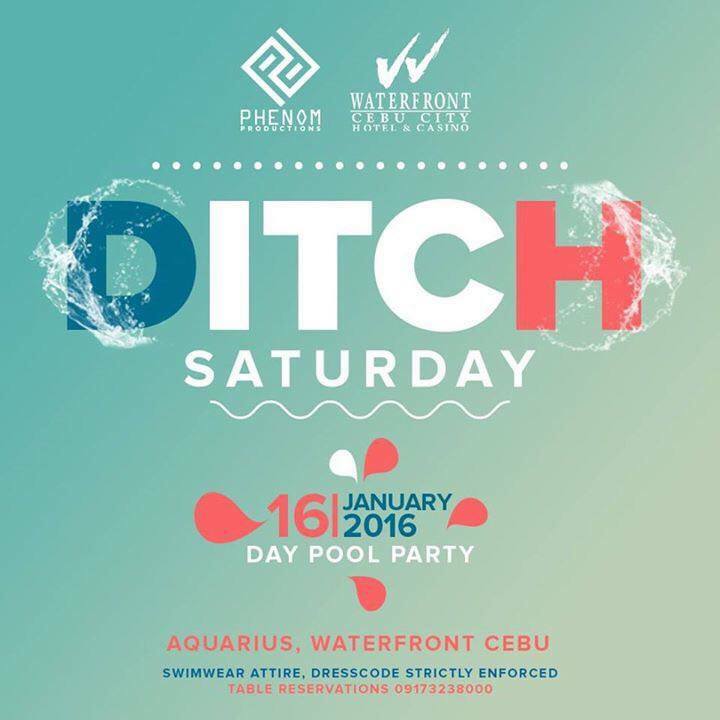 Gather your friends and bring out your best swimwear as Phenom Productions and Waterfront Hotel and Casino bring you DITCH SATURDAY, happening on Aquarius on the 16th of January. For reservations, contact 09173238000. The Invasion Tour is coming home to where it all started: the Sinulog Festival in Cebu! Get ready to experience a wide range of Filipino talent plus a couple guests from the Netherlands, who will be introducing new music and a new sound to the experience. There will probably be a new sound system so to insure that I don´t damage my ears I´ll make sure to bring along the earplugs I was recommended from this earplug advice for concert goers. 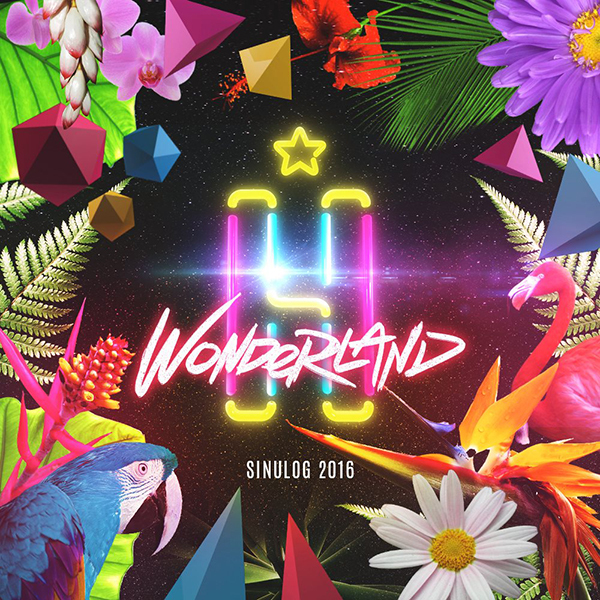 Hyper Cebu and JCI Cebu Inc., present you Hyperwonderland Sinulog 2016. It’s a neon rave party happening on 17th January 2016 (Sunday) at the Vibo Place in Escario Street. General Admission tickets are priced at P250.00 while VIP is at P1,300.00. Tickets are sold at Red Mango (4th floor) in Ayala Center Cebu. Just imagine the banderitas blown by the high speed winds and listening to orchestral version of Sinulog. Here it is! More details coming really soon. Let’s all be a little bit more responsible this year, and we’ll make Sinulog an even funner, celebratory, bigger for each and everyone. That’s whether you are a party junkie, or simply a festival fan. See you!